I don't even know how to review this book. There are so many beautiful layers and corners to explore that I couldn't possibly cover them all. So I'm going to talk about what kept me engrossed and pulling for Andi throughout the story and that was the musical aspect of the plot. The fact that Andi is a musical genius yet seems to squander her talent on grief and pill-popping is not a new concept in the world of music (in fact, if you liked Adam in Where She Went, think of Andi as his female counterpart). And yet, part of her genius is a result of the grief she is experiencing due to the death of her brother Truman and the subsequent deterioration of her family. Andi's passion and talent for guitar playing is evident when she decides to choose the classical guitarist Amade Malherbeau for the subject of her senior thesis. Throughout the story she explains with much certainty, and quite convincingly I might add, that if it weren't for Malherbeau, there would be no Led Zeppelin or Radiohead. I was so invested in Andi's certainty in proving this thesis that I actually BELIEVED this was not fictitious and that this part of the story was where truth creeped in. Which is why I was thoroughly heartbroken when, upon finishing the book, I went to look up the composer Amade Malherbeau to see if I could find any of his recordings at the library, and discovered that he DOESN'T EXIST!!! But I wanted so badly to hear that Fireworks Concerto! I wanted to be able to listen to those tri-tones and minor chords from all the way back in the 18th century and be able to hear Radiohead and "Stairway to Heaven" in them. 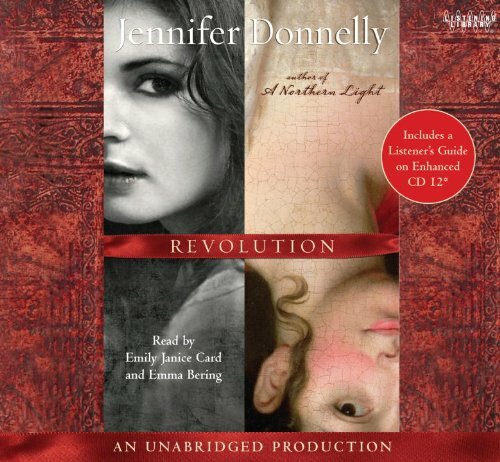 The way Donnelly writes of his music so fluidly and with such authority, I was bereft when I discovered that she merely made up this composer with a few taps of her keyboard. There are certainly other important elements to this story other than music: the strained father/daughter relationship, Andi's discovering of the diary from the French Revolution, mental illness (in Andi's mother as well as Andi herself), and while all of those elements were equally important to the story, music was the thread that stitched the entire story together and what kept me listening. Speaking of listening, a word about the audio production. There were two narrators in this story: Emily Janice Card was Andi, and Emma Bering was Alex. Both of these women did amazing job at playing the characters in the story, and Emily was especially masterful at portraying the roller-coaster emotions of Andi. Her voice had just enough apathetic angst to be convincing and yet was still pleasant to listen to. Plus, listening to the book rather than reading it had the added benefit of getting all of the French pronunciations correct. This is definitely a listening experience I'd recommend, in addition to a story that should not be passed by - even if you don't normally prefer historical fiction. Great review. I cannot wait to read this book, I do love Historcal fiction. Wow, I had no idea she made up Malherbeau LOL. Thanks for enlightening me! I enjoyed this book too.